Observations and Opinions about the real estate market for Augusta, Evans, Martinez, Grovetown, Harlem, Ft. Gordon, Hephzibah, Georgia and North Augusta, South Carolina and surrounding areas. Found 7 blog entries about Greater Augusta Georgia Real Estate Market. Saturday, January 10th, 2015 at 2:08pm. Thinking about selling and would like assistance from a top REALTOR but want to save thousands of dollars on the listing commissions? The Leading Edge Real Estate team offers listing services to fit your needs. Illegal immigrant bust in Augusta GA, will it change new home prices? Sunday, November 20th, 2011 at 11:38am. Recently Construction business owner, Hugo Diaz and his wife Blanca we arrested on various charges including money laundering conspiracy and harboring illegal immigrants. His company is named De La Fuente Construction. There is much controversy about this issue and enough pointing fingers to go around. Questions have been raised about local government officials as well as local businessmen using his company . At the end of the day, do the “below market” prices of labor translate to lower costs to consumers buying homes? Mortgage Rates Continue at Historic Lows! Don't miss out. Sunday, November 13th, 2011 at 2:12pm. I know many of you are sitting on the fence of whether to buy or rent. Daily I have conversations with my clients about housing options. At least in the greater Augusta area with the low interest rates we've been enjoying, renting is often not the most logical answer. Question such as "will prices go lower? ", or "I'm in the military and will only be here for 3 years?" come up all the time. The real answers in my opinion lie in the interest rates that are currently at rock bottom levels. Sunday, April 24th, 2011 at 3:09pm. 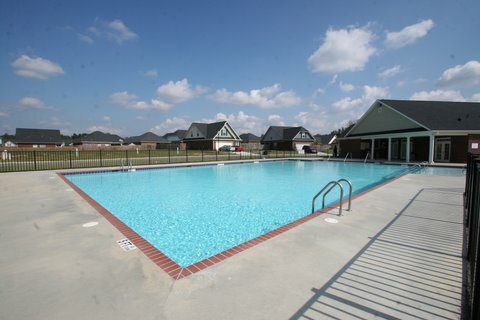 If you've been struggling with locating homes with a community pool, look no further. Check these subdivisions out in our areas best home search tool at this site. As always. we're here to make your home search easy and stress free. Call 706-869-9478 today to see how Christine and Drew will make your customized home search stress free! Complaints about Builders and Poor Quality Construction! Wednesday, March 16th, 2011 at 2:00pm. It seems that when buyers talk about "new construction", they often are concerned about problems related to "construction quality". I often hear comments about they don't build like "in the good old days, etc. Clearly, we live in a different world with many new products and workers that have different values and work ethics. Actually, homes today are built to stricter energy standards than just a few years ago. I also see workers on new home sites working way past what many of us consider normal hours, even framing at 7 PM on a Sunday night in the summer months. What's really happening? Thursday, March 3rd, 2011 at 11:56am. Market Conditions in 2011 for Augusta, Martinez, Evans, Grovetown, Fort Gordon GA Going into 2011 in the Greater Augusta market comes with restrained optimism. Rising interest rates could dampen housing demand but the last couple years have been flat in overall sales transaction volume in the area. Thursday, September 2nd, 2010 at 8:49am. While Animal Planet's Whale Wars take place in the icy Antarctic waters, the builder wars are just getting heated up in Grovetown and the Augusta area overall!